A few days ago, Mam Elisa Montecastro, one of the senior members of PNPCSI, passed away because of an aneurism. It was ironic because at her age of 77, she was one of the more adventurous members of the society. We were shocked to hear about her untimely departure. Our image of Mam Elisa is of an active woman who never backed out from trips and treks. She was always game in joining long walks even uphill to mountains. In the PNPCSI trip to Mt. Makiling, she never complained even when it rained and we had to walk wet on the muddy trail going to the Mud Springs. In the trip to Ilocos Norte last November, she was with her sister Mam Aleli and they were in the advance party to trek to Kabigan Falls and climb the bleached Kapurpurawan formation. In January, she joined the much younger members in the trek up one of the highest points in the Subic forest, walking faster than some of us and making us eat dust. She was enthusiastic even if the reason was to just see flowering specimens of a nice tree or shrub or simply just for the fun of it. Before her death, Mam Elisa commited to join the next PNPCSI activity in Quezon. She will definitely be missed in the trip, and the succeeding ones. But we will always remember Mam Elisa, always full of life, energy and adventure. It seems here in the Metro Manila, we are way behind in the vertical green wall race. Green wall has been here, available locally for quite some time but Pinoys seem to be hesitant in using it, or probably ignorant that it exists. I don't know of any local development that notably made use of it. Come to think of it, I don't know any notable suppliers for the system. In neighboring Taiwan, the presence of the new technology in and around the city of Taipei is very noticeable. The plain and bare public walls and spaces are stacked up with the upright plastic potting system and transforms boring surfaces into living walls of varying shades and textures of green. Designs could be very artistic and even surprising. The green walls are also used as ephemeral aesthetic elements. Construction sites are covered with vertical living wall systems to temporarily hide the blight created. In the international airport, long stretches of renovation are covered with plywood and covered with a wall of familiar ornamental plants like ferns, Dracaena, Philodendron and even Hoya. The street vertical walls utilized species which are very much available in local Philippine nurseries like Japanese bush (Phyllanthus myrtifolius), miagos (Osmoxylon) and golden duranta (Duranta repens var.). We do have the plants necessary to create a successful vertical wall system. We just have to speed up on learning more about green walls and maybe gain in on our Asian neighbors in the use of this new landscape technology! I have a popular post about the magtungaw tree of Sibuyan Island before. I said it is probably Syzygium alcinae, which botanist Ulysses Ferreras at the very start doubted. 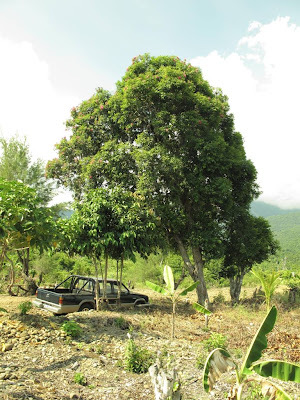 But then again there was no literature to confirm the identity of the so called magtungaw tree in Romblon. When Uly and Ronald Achacoso went to Sibuyan this year, they found that there were actually more than just one species called magtungaw on the island. 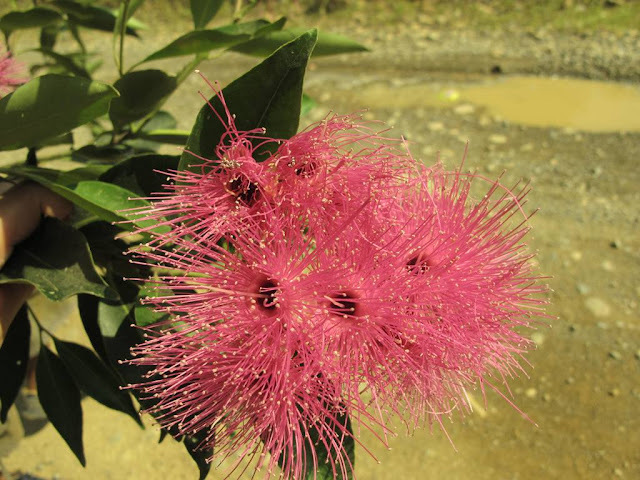 Further, a majority of the native Syzygium species in the area and neighboring islands were either called magtungaw and mangkaasim (which is officially Syzygium nitida but attached to a few more other species). But the identity of magtungaw eluded both. They took new pictures of the magtungaw tree. Last Saturday I chanced upon Uly in U.P. Diliman and he was ecstatic to exclaim he finally found the true identity of the unknown Syzygium, a feat because there are probably more than 200 plus species of Syzygium native in the Philippines and he had to rummage through all its records.. He says that magtungaw is Syzygium merritianum. The next day I also got the eureka text from Ime Sarmiento, who was also very happy to finally learn magtungaw's proper botanic identity from Uly. But she was humoring the sound of magtungaw's official vernacular name, which is tomolad hehehe. She said magtungaw is better sounding. 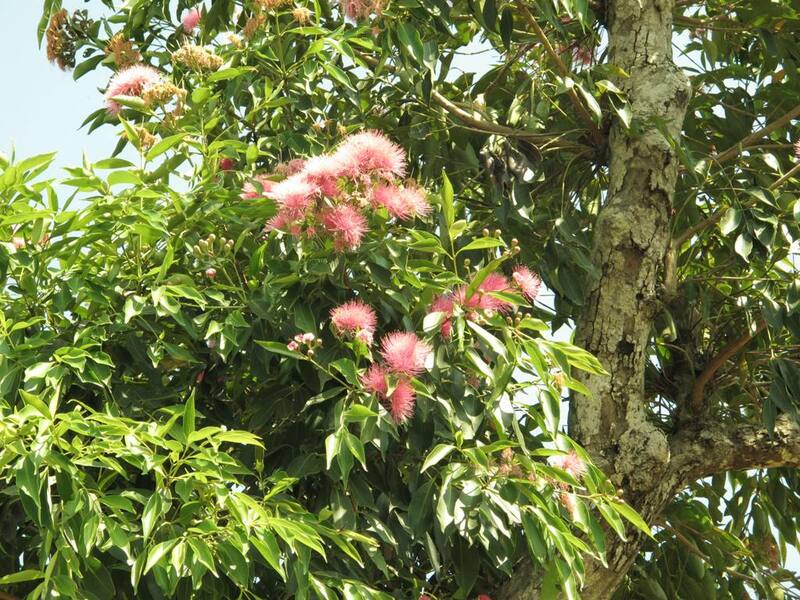 But one thing is clear, magtungaw or tomolad is a darn fine species to use for landscape with the bright pink flowers. I would be happy to introduce it in any local garden. Ime Sarmiento sent me the new magtungaw pictures which was probably taken by the team who went to Sibuyan. So again, magtungaw is finally Syzygium merritianum! Quick Post: My baraibai or Cerbera manghas finally bloomed. The plant is a member of the deadly dogbane family which includes calachuchi. I acquired the plant via seeds given to me by friend, Ronald Achacoso, collected from their farm in Zambales. From a handful, only one plant germinated, and it did only after 6 months of nothing. Almost gave up on the seed batch. But after 4 years the plant is about 5 feet high and flowering. But I really love Apocynaceae plants so the wait is well worth it. 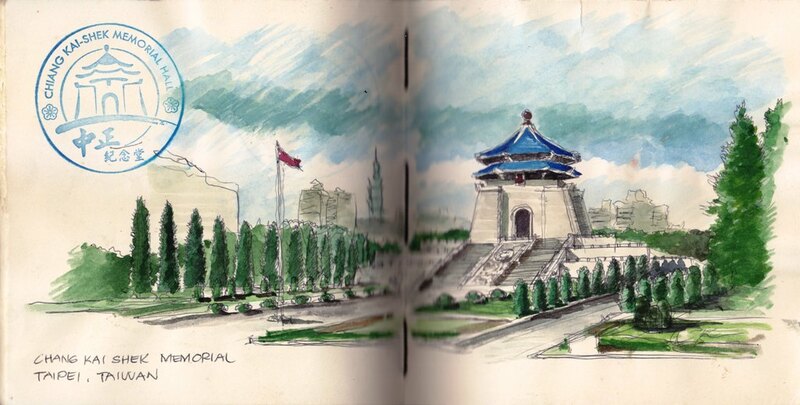 For a year I have been longing to do some travel sketching and I got to do so in Taipei. I got away from our hectic tour schedule and spend the whole morning by myself in Chang Kai Shek Memorial. I braved the 15 minute walk from our hotel towards the nearest MRT station and hopped on a 5-station train ride to the monument. As soon I got off the train and got out of the station, I was astounded to see that the tourist attraction is not what I was expecting. Compared to the other Taipei destinations we have gone to the last few days, Chang Kai Shek Memorial was of gargantuan proportions. I felt very much dwarfed by the scale of the gateway alone. Entering into the complex, I found myself drowned in the vast open space created by the 2 Cultural Buildings. The large traditional Chinese rectangular structures flanked the main gateway at each side while framing the long vista of the memorial proper. Chang Kai Shek's main memorial has an octagonal plan and a shape similar to a Chinese pergola. It is donned in the less traditional blue color. The size is very much overwhelming. Just looking at the distance between the memorial and the main gate made me tired, but I made it to the base to scrutinize the architectural details. It was almost noon when I decided to find my corner, where I could sit and do my usual round of sketching. I found an al fresco cafe at one of the cultural theater buildings. It had a very nice view of the monument plus it presented the chance to sample the tempting cold green tea with mint on the menu. I could not also resist ordering a slice of chocolate cake. I made the far corner table as my vantage point, where I could also watch a group of Chinese ladies performing graceful Tai chi. It was a pleasant scene, very enjoyable to watch. But I had to bring out my trusted pen, journal and watercolour to force myself to finally start sketching. It took about close to an hour, but probably because I wanted to prolong sitting in the comfortable corner while partaking on my tea and cake treats. But what I accomplished drawing this time was not bad at all. I also found an official Chang Kai Shek Memorial stamp seal to make the drawing more authentically done on site. In the Taipei trip, I also found the opportunity to sketch in the National Palace Museum. Of course, as in any other museum, photographs were not permitted in the galleries. So I made use of my sketch journal to make my experience more memorable. I have a personal record of the interesting objects I saw in the different exhibits in the museum which I could refer to again as design inspirations. It was definitely a rare combination and a pleasure for me to handle. Members of the Rare fruit Society of the Philippines and the Philippine Native Plant Conservation Society joined today's native tree walk in U.P. Diliman. Serious plant enthusiast Ponchit Enrile and rowdy RFSP group braved the hot sun and the muddy trails to lend me an ear and learn a little more about native tree species growing in the campus. Plus they brought along the rare fruit guru, Professor Emeritus Roberto Coronel. He shed some light on some of our controversial fruit species. It was an enlightening morning even for me. I was expecting that the Rare Fruit members would be less ecstatic about the non-fruiting species but they seem to be very much into all the natives, even those which do not bear fruit produce. 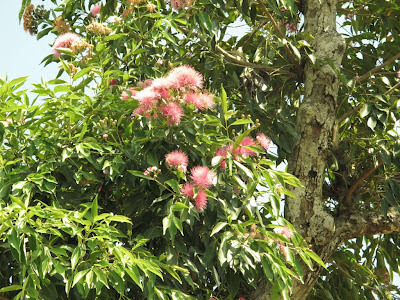 The heavily-berried kalumpit (Terminalia microcarpa) and katmon (Dillenia philippinensis) were the expected favorites. But then again, any other plant which bore seeds (which some participants collected) were also crowd-pleasers. It was also interesting to note that after a few months, the plants in Beta Way and the Marine Scince Institute complex are doing and growing very well. To the members of the Rare Fruit Society of the Philippines, thank you very much for participating in the U.P. native tree walk. It was a pleasant experience to be your guide in today's lesson about native flora.